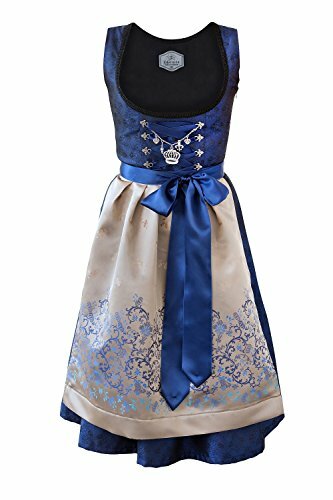 Edelnice Trachtenmoden Bavarian Women's Midi Dirndl Dress 3-Pieces+ Apron RoyalBlue Gold (42(US12)) | What Should I Say? Free Shipping Included! Edelnice Trachtenmoden Bavarian Women's Midi Dirndl Dress 3-Pieces+ Apron RoyalBlue Gold (42(US12)) by Edelnice Trachtenmoden at What Should I Say?. MPN: EN121272. Hurry! Limited time offer. Offer valid only while supplies last. Extraordinary elegance and the finest fabrics - a dream in royal blue. This charming Dirndl our Exclusive collection makes your dreams come true! Extraordinary elegance and the finest fabrics - a dream in royal blue. This charming Dirndl our Exclusive collection makes your dreams come true! Using the highest quality materials this dress was produced for you. The royal blue fabric of the dress and the gold-shining apron give a fascinating picture. is located on the sweet Edelweiss checkmark on the front a Dirndl Charivari, the matching could not be: In the middle prominently emblazoned a large crown surrounded by the Fleur-de-lis and small heart pendants. To close the Dirndl side with a graceful, concealed zipper sewn. Very comfortable to wear, perfect for any size! If you have any questions about this product by Edelnice Trachtenmoden, contact us by completing and submitting the form below. If you are looking for a specif part number, please include it with your message.